To Cite: Golestani M H, Rasti S, Hooshyar H, Delavari M, Mousavi S G A, et al. Molecular Identification and Genotyping of Acanthamoeba Isolated from Environmental Sources in Kashan, Central Iran, Jundishapur J Microbiol. 2018 ; 11(4):e55582. doi: 10.5812/jjm.55582. Background: Acanthamoeba is one of the most common opportunistic free-living amoebae, with ubiquitous presence in various environmental sources. Pathogenic strains of Acanthamoeba are the causative agents of amoebic keratitis and granulomatous amoebic encephalitis. Objectives: The aim of the present study was to identify Acanthamoeba genotypes in soil, hospital dust, and stagnant water samples from Kashan, Central Iran. Methods: In this cross sectional study, a total of 122 samples from soil (n, 32), hospital dust (n, 40), and stagnant water (n, 50) were collected and examined for the presence of free-living amoebae and Acanthamoeba species. All the samples were cultured onto non-nutrient agar plates for detection of free-living amoebae. Acanthamoeba species was identified by polymerase chain reaction (PCR) assay, using specific primers. A total of 29 Acanthamoeba isolates were sequenced, and different genotypes were detected via sequence analysis. Results: The results showed that 82.8% (101/122) of samples were positive for free-living amoebae. The PCR assay revealed that 62.5%, 52.5%, and 50% of soil, hospital dust, and stagnant water samples were positive for Acanthamoeba species, respectively. Moreover, T4, T5, T2, T7, and T11 genotypes were identified. The most common genotype was T4 (76%), isolated from stagnant water. Conclusions: Acanthamoeba is a prevalent species in the soil, hospital dust, and stagnant water of Kashan. As this protozoon can cause severe infections, health education and improvement of sanitation services are recommended for prevention of infection. Acanthamoeba is a prevalent genus of free-living amoebae, found in various environmental sources. Human infection with Acanthamoeba can result in brain, eye, skin, and lung diseases (1). Isolation of Acanthamoeba cysts from environmental sources, such as soil, dust, and stagnant water, shows that environmental sources play an important role in the transmission of amoebae to humans and other mammals (1, 2). Acanthamoeba transmission is possible through the nostrils, skin lesions, and contact lenses. Immunocompromised and AIDS patients are susceptible to Acanthamoeba infections. These infections may cause acute diseases, such as granulomatous amoebic encephalitis (GAE), skin lesions, and pneumonia, which may lead to death (1). In addition, amoebic keratitis has been reported in contact lens wearers and may lead to blindness (1). Molecular methods, especially polymerase chain reaction (PCR) on variant regions of 18s rRNA genes, are used for identification and taxonomy of Acanthamoeba species. According to the sequencing of 18s rRNA genomes, 20 Acanthamoeba genotypes (T1-T20) have been identified (1, 3). Different studies have shown that T4 is the most common genotype of Acanthamoeba spp. to cause amoebic keratitis and GAE (1). T4, T6, and T2 genotypes of Acanthamoeba spp. have been abundantly reported in fresh and stagnant water, soil, and warm water of Iran (4, 5). According to previous studies, Acanthamoeba is present in 25.4% to 71.6% of water samples from East Azerbaijan and Ahwaz, Iran (6, 7). In addition, 26% of soil samples from Ahwaz and Tehran contain Acanthamoeba spp. (6, 8). Niyyati in another study from Iran showed that all 13 dust samples contained T4 genotypes, which can cause amoebic keratitis (9). The prevalence of Acanthamoeba spp. was 42.4% in water samples from Zabol, Iran (10) and 84.6% and 58.6% in water and soil samples from Pakistan, respectively (11). Also, in Brazil, 55% of stagnant water samples were infected with Acanthamoeba (12). Because of specific weather conditions and dust storms in Kashan, people, especially immunocompromised patients, are at a greater risk of infection due to free-living amoeba and Acanthamoeba. Furthermore, mosques have many ablution pools, which may transmit amoebae, responsible for GAE and amoebic keratitis. Considering the role of Acanthamoeba spp. in GAE and amoebic keratitis (1) and transmission of this organism via water, soil, and dust containing amoebic cysts (1), we aimed to identify the genotypes of Acanthamoeba spp. in soil, hospital dust, and water samples from Kashan, Iran. To the best of our knowledge, no similar studies have been conducted regarding the prevalence and genotyping of Acanthamoeba in different environmental sources of Kashan, Central Iran. The ethics committee of Kashan University of Medical Sciences approved this study (IR.KUMS.Rec.1394.126). Kashan is a city located in the North of Dasht-e Kavir. It is a historical city with attractive sights in the Northwest of Isfahan Province, Central Iran. Kashan, with a population of nearly 400,000 people, is situated in 51 degrees 27 minutes east longitude and 33 degrees 59 minutes north latitude (altitude from the sea level, 950 m). The mean temperature is 19°C, which can reach as high as 50°C. The annual rainfall has been averaged as 137 mm, and the average humidity is 37%; stormy winds are common in Kashan (13). In this cross sectional study, a total of 122 samples were randomly collected from numerous environmental sources, including soil (n, 32), hospital dust (n, 40), and stagnant surface water (n, 50) from Kashan during February 2015 and December 2016. The samples were transferred to the Department of Parasitology of Kashan University of Medical Sciences. The soil samples (12 g) were obtained from Kashan parks, while dust samples were collected from the immunodeficiency wards of Shahid Beheshti hospital (including the infectious diseases and chemotherapy wards), the Ear, Nose, and Throat (ENT) Center of Matini Hospital, and Hemodialysis Unit of Akhavan Hospital. The samples were investigated for the presence of free-living amoebae and Acanthamoeba strains. In addition, 300 mL of stagnant water from pools in parks was checked for the presence of these organisms. The soil and hospital dust samples were dissolved in 100 and 20 mL of sterile distilled water, respectively, while the supernatants and stagnant water samples were filtered using a pumping machine (AEI, UK) with a 0.45-μm cellulose nitrate filter (Sartorius Stedim, Spain). Each filter was placed upside down on 1.5% non-nutrient agar (NNA) plates, containing Bacto Agar (DIFCO, USA), with Page’s amoeba saline seeded alongside heat-killed Escherichia coli (4). Following that, all the plates were sealed and incubated at 27°C to 29°C. The gauze of dust samples was incubated on another NNA medium. Then, the plates were monitored in order to detect free-living amoeba plaques daily for 30 days. The positive samples were recultivated in order to harvest amoebae. The agar surface was scraped with a sterile swab after the addition of 5 mL of phosphate-buffered saline (PBS) to the medium. The suspension containing the amoebae was collected in a tube and washed 3 times with PBS (pH, 7.2) at 600 g for 2.5 minutes. As soon as the sediment contained adequate amoebae, it was transferred to a 1.5 microtube and kept at -20°C for DNA extraction. Total genomic DNA from the positive samples was extracted using a Dyna Bio Kit (Takapuzist, Iran) and stored at -20°C. The PCR assay was performed using a pair of genus-specific primers, i.e., JDP1 (5′GGCCCAGATCGTTTACCGTGAA-3′) and JDP2 (5′TCTCACAAGCTGCTAGGGGAGTCA-3′), as described in the literature (4, 11). 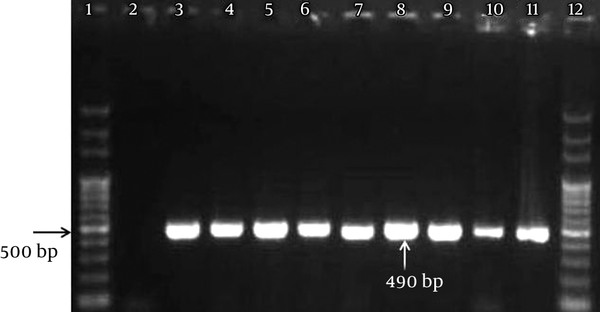 These sets of primers amplified a 500-bp fragment in 18S ribosomal RNA specific to Acanthamoeba species. The PCR reaction was performed in a volume of 20 μL, containing Taq DNA polymerase (Master Mix RED, Ampliqon, Denmark), 10 ng of DNA templates, and 10 pmol of each primer and distilled water. The PCR cycles were set up as follows: initial denaturation at 94°C for 4 minutes and 33 cycles of denaturation at 94°C for 35 seconds, annealing at 57°C for 45 seconds, extension at 72°C for 1 minute, and a final extension for 5 minutes at 72°C in a thermocycler (Flexcycler2, Germany). The PCR products were electrophoresed on 1.5% Agarose gel, stained with ethidium bromide solution (0.5 μg/mL), and visualized under UV light. Twenty-nine positive samples (7 soil, 11 hospital dust, and 11 stagnant water samples) with perfect PCR products were selected for sequence analysis. Samples were sequenced in forward directions with a forward primer, JDP1, in an automatic sequencer (ABI 3730XL Genetic Analyzer, USA) at South Korea (via Takapozist, Iran). The genotype of Acanthamoeba spp. was identified by comparing each nucleotide sequence with DNA sequences from the GenBank. The Clustalw2 program was used for alignment of different sequences. The data were recorded in SPSS version 16.5 (SPSS Inc., Chicago, IL, USA) and analyzed by Chi square test. P value less than 0.05 was considered to be significant. In total, 122 environmental samples, including soil, hospital dust, and stagnant water samples, were collected in this study. Out of 122 environmental samples, 101 (82.8%) were positive for free-living amoebae in cultivation, as shown in Table 1. Based on the molecular method (PCR assay), 490-bp bands were identified as Acanthamoeba spp., using specific primers, JDP1 and JDP2 (Figure 1). Overall, 66 out of 122 (54.1%) environmental samples were positive for Acanthamoeba. The prevalence of Acanthamoeba spp. was 20 (62.5%) in soil, 21 (52.5%) in hospital dust, and 25 (50%) in stagnant water samples, respectively (Table 1); the difference was not statistically significant (P = 0.52). T4 was the most common Acanthamoeba genotype (76%), followed by T5 (13.8%). T2 (3.4%), T7 (3.4%), and T11 (3.4%) genotypes were also identified in soil and hospital dust samples (Table 2). Lane 1: 100-bp marker; lane 2: negative control; lane 3: positive control; lane 4 - 6: hospital dust; lane 7 - 8: soil; lane 9 - 11: Acanthamoeba-positive samples from stagnant water; lane 12: 100-bp marker. The sequences showed 95% - 100% similarity to the deposited sequences in GenBank from other parts of Iran and other countries. Twenty-nine sequences were deposited in the GenBank, with the following accession numbers: hospital dust (LC184513-19, LC183867, LC276839-40, and LC310897.1), soil (LC179879, LC179880, LC276836-38, LC310895.1, and LC310896.1), and stagnant water (LC177106-09, LC177665-67, LC179878, LC179877, and LC276880-81). The current study showed that the prevalence rates of free-living amoebae and Acanthamoeba spp. were 90.6% and 62.5% in the soil samples, respectively. In a previous study, the free-living amoebae and Acanthamoeba spp. were identified in 26.9% and 17.3% of soil samples, respectively (8). In addition, the prevalence of Acanthamoeba has been estimated at 26% - 51.8% (6, 14, 15), which is lower than the results of the present study. On the other hand, Reyes-Batlle et al. (16) reported that 62.5% of soil samples from Gran Canaria, Spain were positive for Acanthamoeba spp., which is similar to our results. Overall, due to the high prevalence of Acanthamoeba spp. in soil, children are at a high risk of infection due to playing in parks. In the present study, the prevalence of free-living amoebae and Acanthamoeba spp. in hospital dust from ENT, chemotherapy, and hemodialysis wards was 72.5% and 52.5%, respectively. The lowest rate of Acanthamoeba pollution was reported in the hemodialysis ward in the center of the city, while the highest rates were found in the ENT and chemotherapy wards, which lacked adequate health facilities. Also, water purification devices and sterilization/disinfection of hemodialysis ward were performed daily. In previous studies, the prevalence of free-living amoebae in the immunodeficiency wards of hospitals was reported to be 52.9% (17) and 42.8% (18) in Tehran, Iran, respectively. On the other hand, the prevalence of Acanthamoeba spp. in hospital dust samples from Brazil was reported to be 23% (19), which is lower than the present study. Variations in geographic conditions, climate, and health facilities affect the incidence of Acanthamoeba. Kashan is a city situated near the desert. This region has low levels of rainfall and seasonal wind storms, which are followed by extreme dust storms. These conditions facilitate an increase in Acanthamoeba pollution and can explain the high prevalence of this parasite in our study. The results of the present study showed that stagnant water samples were highly polluted with free-living amoebae. This finding is similar to the results of previous studies (80% - 88%) (10, 20). Moreover, in the current study, the prevalence of Acanthamoeba spp. in stagnant water samples was 50%, which is higher than the rates reported by other researchers from Iran (43%) (20) and Turkey (21%) (21). Furthermore, the results of sequencing revealed that most Acanthamoeba isolates belonged to T4 genotypes, followed by T5. In the present study, T4, T5, and T11 genotypes were identified in the soil. Another researcher has reported T3, T4, T5, and T11 genotypes in the soil of Iran (14). Reyes-Batlle et al. also found T4, T2, and T11 genotypes in soil samples from Spain (22). In the present study, T4, T5, T2, and T7 genotypes were isolated from hospital dust samples in Kashan. In addition, Niyyati found T4, T5, and T11 genotypes in hospital dust (9). All stagnant water samples belonged to T4 genotypes, which is in agreement with the results of previous studies (23, 24). Maghsood et al. also reported Acanthamoeba T4 and T2 genotypes in clinical isolates (25). Acanthamoeba spp. seems to be responsible for an increase in fatal diseases, such as amoebic encephalitis (26). Furthermore, Acanthamoeba T4 genotype is pathogenic and predominantly associated with amoebic keratitis (4, 27). The results of this study showed that the prevalence of free-living amoebae and Acanthamoeba spp. in environmental sources, including soil, hospital dust, and stagnant water was higher in Kashan, compared to other areas of Iran and other countries. The most important Acanthamoeba genotype was T4 in the hospital dust samples of the immunodeficiency ward. This organism is pathogenic and responsible for amebic keratitis and GAE; therefore, health education and sanitation services are recommended for the prevention of these diseases. The authors would like to thank the Vice-chancellor for Research of Kashan University of Medical Sciences for the financial support (grant No., 94125). The authors also thank Dr. Amir Abdoli for his sincere cooperation. Authors' Contribution: Study concept and design: Sima Rasti, Hossein Hooshyar, and Mohammad Hossein Golestani; acquisition of data: Mohammad Hossein Golestani, Leila Iranshahi, Ali Aghajani; statistical analysis: Seyed Gholam Abbas Mousavi; analysis and interpretation of data: Sima Rasti, Seyed Gholam Abbas Mousavi, Mohammad Hossein Golestani, and Hossein Hooshyar; drafting of the manuscript: Sima Rasti, Hossein Hooshyar, Mohammad Hossein Golestani, and Mahdi Delavari; critical revision of the manuscript for important intellectual content: Sima Rasti, Hossein Hooshyar, Mahdi Delavari. Funding/Support: This study was supported by Kashan University of Medical Sciences (grant No., 94125). 1. Visvesvara GS, Moura H, Schuster FL. Pathogenic and opportunistic free-living amoebae: Acanthamoeba spp., Balamuthia mandrillaris, Naegleria fowleri, and Sappinia diploidea. FEMS Immunol Med Microbiol. 2007;50(1):1-26. doi: 10.1111/j.1574-695X.2007.00232.x. [PubMed: 17428307]. 2. Shin HJ, Im KI. Pathogenic free-living amoebae in Korea. Korean J Parasitol. 2004;42(3):93-119. [PubMed: 15381859]. 3. Behera HS, Panda A, Satpathy G, Bandivadekar P, Vanathi M, Agarwal T, et al. Genotyping of Acanthamoeba spp. and characterization of the prevalent T4 type along with T10 and unassigned genotypes from amoebic keratitis (AK) patients in India. J Med Microbiol. 2016. doi: 10.1099/jmm.0.000234. [PubMed: 26887324]. 4. Niyyati M, Lorenzo-Morales J, Rezaie S, Rahimi F, Mohebali M, Maghsood AH, et al. Genotyping of Acanthamoeba isolates from clinical and environmental specimens in Iran. Exp Parasitol. 2009;121(3):242-5. doi: 10.1016/j.exppara.2008.11.003. 5. Badirzadeh A, Niyyati M, Babaei Z, Amini H, Badirzadeh H, Rezaeian M. Isolation of free-living amoebae from sarein hot springs in ardebil province, iran. Iran J Parasitol. 2011;6(2):1-8. [PubMed: 22347281]. 6. Rahdar M, Niyyati M, Salehi M, Feghhi M, Makvandi M, Pourmehdi M, et al. Isolation and genotyping of acanthamoeba strains from environmental sources in ahvaz city, khuzestan province, southern iran. Iran J Parasitol. 2012;7(4):22-6. [PubMed: 23323088]. 7. Behniafar H, Niyyati M, Lasjerdi Z. Molecular Characterization of Pathogenic Acanthamoeba Isolated from Drinking and Recreational water in East Azerbaijan, Northwest Iran. Environ Health Insights. 2015;9:7-12. doi: 10.4137/EHI.S27811. [PubMed: 26157334]. 8. Ebrahimi M, Niyyati M, Haghighi A, Haydari S. Isolation and genotyping of Acanthamoeba spp. from recreational soil of parks in Tehran, Iran. Armaghane Danesh Bimonth J. 2013;18(7):530-8. 9. Niyyati M, Lorenzo-Morales J, Rahimi F, Motevalli-Haghi A, Martin-Navarro CM, Farnia S, et al. Isolation and genotyping of potentially pathogenic Acanthamoeba strains from dust sources in Iran. Trans R Soc Trop Med Hyg. 2009;103(4):425-7. doi: 10.1016/j.trstmh.2008.12.007. [PubMed: 19185896]. 10. Aghajani A, Dabirzadeh M, Maroufi Y, Hooshyar H. Identification of Acanthamoeba Genotypes in Pools and Stagnant Water in Ponds in Sistan Region in Southeast Iran. Turkiye Parazitol Derg. 2016;40(3):132-6. doi: 10.5152/tpd.2016.4428. [PubMed: 27905281]. 11. Tanveer T, Hameed A, Gul A, Matin A. Quick survey for detection, identification and characterization of Acanthamoeba genotypes from some selected soil and water samples across Pakistan. Ann Agric Environ Med. 2015;22(2):227-30. doi: 10.5604/12321966.1152070. 12. Alves Dde S, Moraes AS, Nitz N, de Oliveira MG, Hecht MM, Gurgel-Goncalves R, et al. Occurrence and characterization of Acanthamoeba similar to genotypes T4, T5, and T2/T6 isolated from environmental sources in Brasília, Federal District, Brazil. Exp Parasitol. 2012;131(2):239-44. doi: 10.1016/j.exppara.2012.04.011. 13. Iranicaonline. KASHAN i. GEOGRAPHY. 2015. Available from: http://www.iranicaonline.org/articles/kashan-i-geography. 14. Karamati SA, Niyyati M, Lorenzo-Morales J, Lasjerdi Z. Isolation and molecular characterization of Acanthamoeba genotypes isolated from soil sources of public and recreational areas in Iran. Acta Parasitol. 2016;61(4):784-9. doi: 10.1515/ap-2016-0108. [PubMed: 27787217]. 15. Wagner C, Reyes-Batlle M, Hernan A, Rojas E, Perez G, Lopez-Arencibia A, et al. High occurrence of Acanthamoeba genotype T4 in soil sources from Bolivar State, Venezuela. Acta Parasitol. 2016;61(3):466-70. doi: 10.1515/ap-2016-0063. [PubMed: 27447209]. 16. Reyes-Batlle M, Todd CD, Martin-Navarro CM, Lopez-Arencibia A, Cabello-Vilchez AM, Gonzalez AC, et al. Isolation and characterization of Acanthamoeba strains from soil samples in Gran Canaria, Canary Islands, Spain. Parasitol Res. 2014;113(4):1383-8. doi: 10.1007/s00436-014-3778-z. [PubMed: 24449449]. 17. Lasjerdi Z, Niyyati M, Haghighi A, Shahabi S, Biderouni FT, Taghipour N, et al. Potentially pathogenic free-living amoebae isolated from hospital wards with immunodeficient patients in Tehran, Iran. Parasitol Res. 2011;109(3):575-80. doi: 10.1007/s00436-011-2288-5. [PubMed: 21365453]. 18. Lasjerdi Z, Niyyati M, Lorenzo-Morales J, Haghighi A, Taghipour N. Ophthalmology hospital wards contamination to pathogenic free living Amoebae in Iran. Acta Parasitol. 2015;60(3):417-22. doi: 10.1515/ap-2015-0057. [PubMed: 26204177]. 19. Carlesso AM, Artuso GL, Caumo K, Rott MB. Potentially pathogenic acanthamoeba isolated from a hospital in Brazil. Curr Microbiol. 2010;60(3):185-90. doi: 10.1007/s00284-009-9523-7. [PubMed: 19841975]. 20. Hosseinbigi B, SahnehSaraie MS, Alizadeh SA, Rasti S, Eftakhar M, Khosro-Shahi N, et al. Isolation and molecular identification of Acanthamoeba in surface stagnant waters of Qazvin. J Qazvin Univ Med Sci. 2012;16(3):26-32. 21. Kilic A, Tanyuksel M, Sissons J, Jayasekera S, Khan NA. Isolation of Acanthamoeba isolates belonging to T2, T3, T4 and T7 genotypes from environmental samples in Ankara, Turkey. Acta Parasitologica. 2004;49(3):246-52. 22. Reyes-Batlle M, Zamora-Herrera J, Vargas-Mesa A, Valeron-Tejera MA, Wagner C, Martin-Navarro CM, et al. Acanthamoeba genotypes T2, T4, and T11 in soil sources from El Hierro island, Canary Islands, Spain. Parasitol Res. 2016;115(8):2953-6. doi: 10.1007/s00436-016-5048-8. [PubMed: 27075307]. 23. Kao PM, Hsu BM, Chen CT, Huang SW, Kao ES, Chen JL, et al. Identification and quantification of the Acanthamoeba species and genotypes from reservoirs in Taiwan by molecular techniques. Acta Trop. 2014;132:45-50. doi: 10.1016/j.actatropica.2013.12.020. [PubMed: 24388954]. 24. Nazar M, Haghighi A, Niyyati M, Eftekhar M, Tahvildar-Biderouni F, Taghipour N, et al. Genotyping of Acanthamoeba isolated from water in recreational areas of Tehran, Iran. J Water Health. 2011;9(3):603-8. doi: 10.2166/wh.2011.152. [PubMed: 21976207]. 25. Maghsood AH, Sissons J, Rezaian M, Nolder D, Warhurst D, Khan NA. Acanthamoeba genotype T4 from the UK and Iran and isolation of the T2 genotype from clinical isolates. J Med Microbiol. 2005;54(Pt 8):755-9. doi: 10.1099/jmm.0.45970-0. [PubMed: 16014429]. 26. Khan NA. Acanthamoeba: biology and increasing importance in human health. FEMS Microbiol Rev. 2006;30(4):564-95. doi: 10.1111/j.1574-6976.2006.00023.x. [PubMed: 16774587]. 27. Zhao G, Sun S, Zhao J, Xie L. Genotyping of Acanthamoeba isolates and clinical characteristics of patients with Acanthamoeba keratitis in China. J Med Microbiol. 2010;59(Pt 4):462-6. doi: 10.1099/jmm.0.016667-0. [PubMed: 20056772].